Totally called it: The Dismemberment Plan is playing this year's Virgin Mobile FreeFest on Oct. 6 at Merriweather Post Pavillion. Also on the two main stages' lineups: Jack White, Skrillex, Nas, M83, ZZ Top, Santigold, Alabama Shakes, Ben Folds Five, Allen Stone, Trampled by Turtles, Portugal. The Man, Das Racist, Future Islands, and I.M.P. fave Justin Jones. In the Dance Forest: Above & Beyond, Porter & Zedd, Thomas Gold, Nervo, local Alvin Risk, and Penguin Prison, with more TBA. 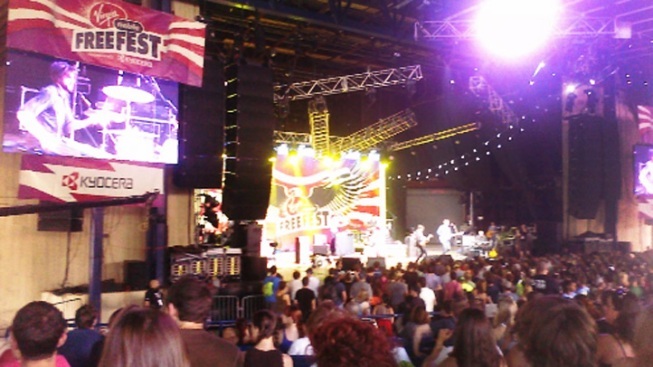 Tickets to the 2012 Virgin Mobile FreeFest will go “On Free” to the public at noon (EDT) Friday, Aug. 24, via ticketfly.com. Fans who choose to follow Virgin Mobile Live on Twitter (@virginmlive) will see a link to participate in the private presale, which will be held Thursday, Aug. 23. Virgin Mobile customers and prior Virgin Mobile Festival ticket buyers will get special notification of the presale in advance as well. Not-so-instant reaction to the lineup coming soon. Virgin Mobile FreeFest Lineup: Dismemberment Plan, Jack White, Skrillex was originally published by Washington City Paper on Aug. 13, 2012.